ITIA CONTRIBUTION TO THE TRAVEL INDUSTRY AWARD. Maureen Ledwith and Edmund Hourican. The ITIA Awards as always delivered a great night of fun and awards galore to deserving trade partners across all segments of our wonderful Industry, congratulations to you all. 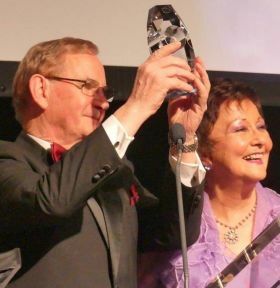 I would like to sound a special BIG TRAVELBIZ CONGRATULATION to Maureen Ledwith and Edmund Hourican, recipients of the ITIA CONTRIBUTION TO THE TRAVEL INDUSTRY AWARD. I have known this dynamic duo for close on thirty years. Their endless energy, positivity and support of our Industry through all that they do is invaluable. The collaboration and interaction of trade partners from all over the world happens every year via Holiday World Shows, ITIA Awards, ITAA Midterm trade shows and constant communication to encourage engagement and participation with retail and wholesale partners on the Island of Ireland. I have worked and participated in all that Maureen and Edmund do for our Industry throughout my career and their support and friendship is one I will always treasure and continue to support through all that I do. We should take time out and make sure we thank Maureen and Edmund for all that they do and continue to do to bring the World of Holidays to our shores. Don Shearer (Travelbiz Managing Director and Publisher.